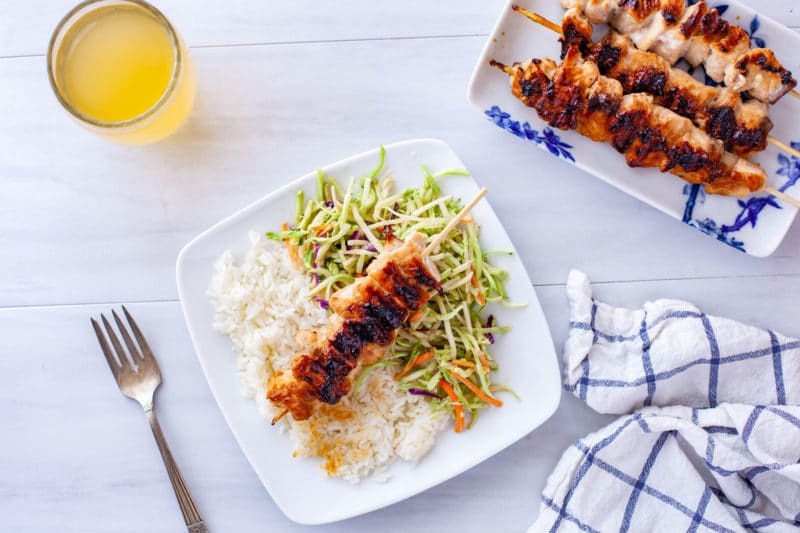 When I need a little bit of summer in the depths of winter, or want to throw together something for a quick summer meal, grilled teriyaki salmon skewers are a perfect fit. I love that I can throw together a spectacular looking and satisfying meal with just a few ingredients I always have on hand. While the salmon skewers look fancy enough for entertaining, they’re also easy enough for a weeknight dinner. They’re also a whole lot of fun for kids to eat. HOW DO YOU MAKE GRILLED SALMON WITH TERIYAKI SAUCE? There are a lot of options to make grilled salmon with teriyaki sauce. First, while you might be tempted to take a shortcut and use store-bought teriyaki sauce, I strongly recommend you resist! While using a store-bought sauce might save you a few minutes, you won’t get the same result. Processed sauces are loaded with all kinds of thickeners and preservatives, and some are cooked before bottling. This mean the sauce is much more likely to burn on the grill, and it can’t soak into the fish like a sauce made from scratch. 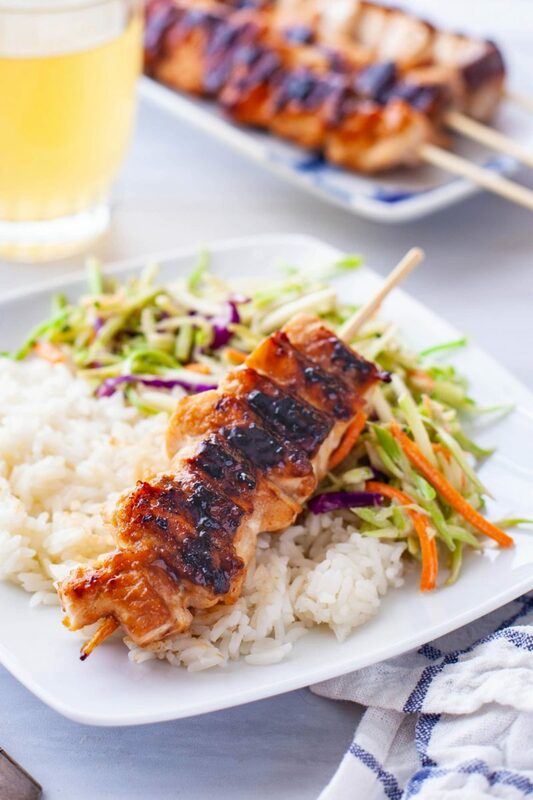 IF YOU LIKE GRILLED TERIYAKI SALMON SKEWERS BE SURE TO CHECK OUT OUR SOY SALMON SKEWERS! CAN YOU PUT TERIYAKI SAUCE ON SALMON? You sure can! 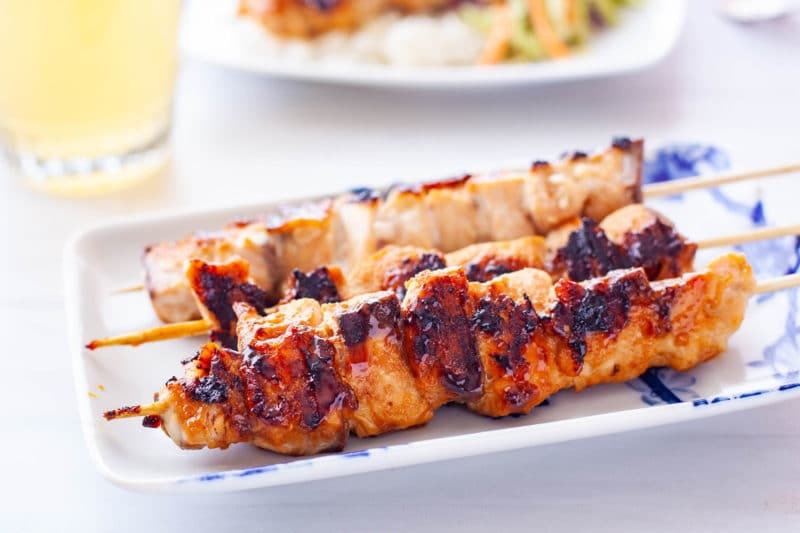 When making grilled salmon skewers with teriyaki sauce, the homemade sauce can be used as both a marinade and as a baste while the fish is grilling. Grilling caramelizes the sugars in the teriyaki sauce leaving a tasty sweet glaze on each piece of fish. HOW DO YOU MARINATE SALMON IN TERIYAKI SAUCE? Simply lay the fish in the bottom of a flat baking dish, making sure the fish is in one layer. Pour the marinade over the fish, cover the pan, and refrigerate for an hour, turning the fish partway through. If you’re in a hurry, skip the marinade step. Sprinkle the fish with salt and pepper, then grill, using a brush to spread teriyaki sauce over the fish as it cooks. TURN LEFTOVER GRILLED TERIYAKI SALMON SKEWERS INTO A HEALTHY SUSHI BOWL! HOW DO I COOK SALMON SKEWERS? Wondering how to cook salmon skewers so you don’t end up with dried out fish? Once you get the pieces of fish skewered, you have a lot of choices – you can grill, broil, bake, or pan fry! If the weather is cold or wet, I usually cook my grilled teriyaki salmon skewers in a grill pan on the stove. Throughout the summer I’m all about the charcoal grill! You can easily pan fry salmon skewers in a skillet, just make sure you have a skillet that is big enough to fit the skewers. A griddle is another great option for pan frying. What temperature should grilled salmon be? The temperature of grilled salmon should be around 130°F. To achieve a silky but fully cooked fish, use medium indirect heat. Direct heat can cause the sauce to cook too quickly, leaving the inside of the fish raw and the outside dried and burnt. Be sure if you’re grilling to oil the grate. I use a paper towel soaked in oil that I rub on the grill with tongs. Oiling the grill keeps the salmon skewers from sticking and makes cleanup so much easier. Use an oil with a high smoke point to avoid burning – safflower and avocado oil are great choices. If using a grill pan, just rub a little oil onto the pan before heating. When your fish reaches the temp you want, remove it from the grill and tent it with foil to rest for a few minutes. Tenting lets the fish finish cooking, using the carryover heat from the grill, without overcooking it. HAVE A WHOLE SALMON? TRY COOKING A WHOLE SALMON IN THE OVEN, NO CHOPPING NEEDED! TIP: You can use any size salmon fillet for your salmon skewers, but make sure it is thick enough to be skewered without falling apart. You want roughly 1-inch square cubes. Preheat the grill, grill pan or broiler. Take the defrosted or fresh fish and lay flat on a cutting board. Pat the fish dry and cut it into 1-inch cubes. Next make the teriyaki glaze. Combine brown sugar, Dijon mustard, soy sauce, and white vinegar in a small bowl. Grill or broil for 3 – 4 minutes. After this, turn the skewers and recoat the fish with glaze. Grill or broil for another 3 – 4 minutes. 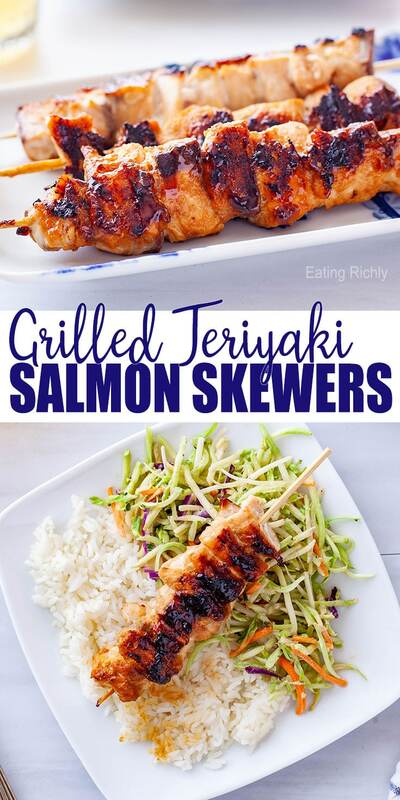 The your grilled teriyaki salmon skewers are done when the fish flakes easily with a fork. Be sure to pull the salon skewers off the heat before they are so dry they shred Flaking means it should just pull apart easily into tender chunks. 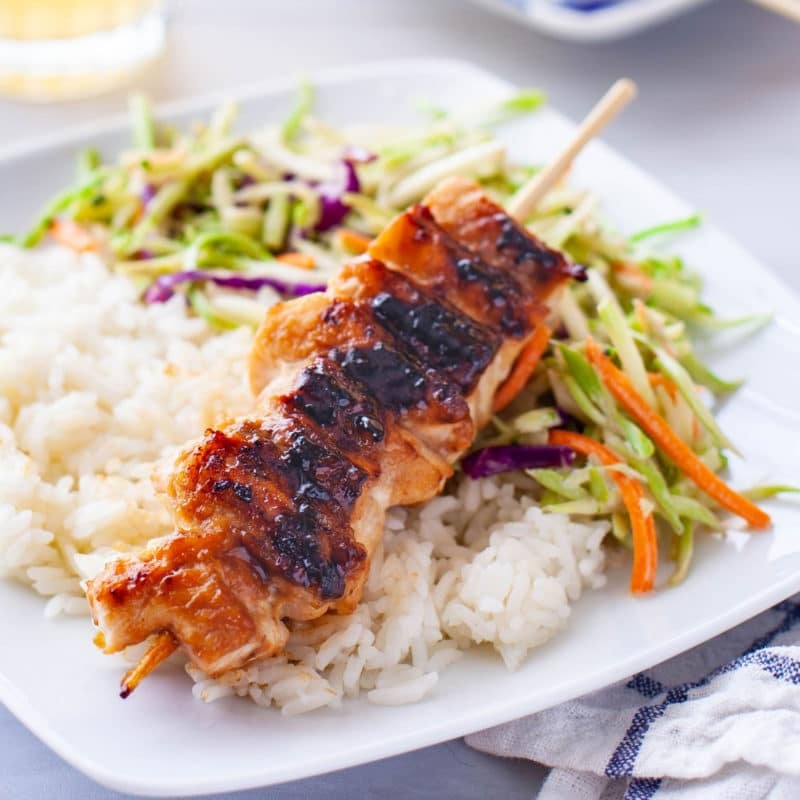 I love to serve grilled teriyaki salmon skewers with white rice or cauliflower rice, and crisp coleslaw or broccoli salad. In the winter, it pairs beautifully with roasted potatoes and broccoli or asparagus. Or, if you’re a ravenous breastfeeding mom, just eat these salmon skewers on their own while you feed your baby. Trust me, they’re perfect one handed nursing mama food! Don’t lose the recipe! Pin these salmon skewers to save for later, then leave a photo in the comments of the pin when you’ve made them. We love seeing what you cook! 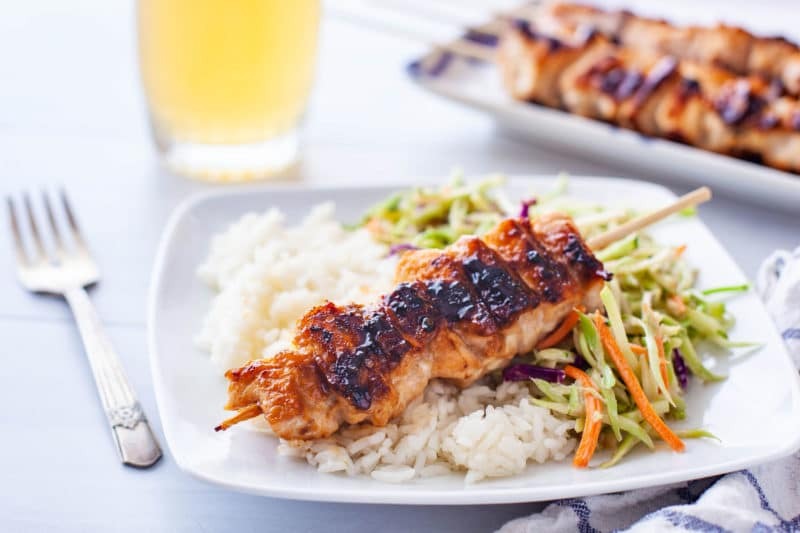 Grilled teriyaki salmon skewers are a quick way to turn chunks of salmon into savory sweet seafood nuggets on a stick. If you have a little extra time, marinate the salmon chunks in the fridge for an hour before skewering. Inspired by Genius Kitchen. Pat fish dry with paper towels then cut into 1-inch cubes. In small bowl, combine sauce ingredients, mixing well with a fork. Thread fish onto four skewers and brush both sides with sauce. Broil, or grill at medium high heat for about 3 minutes. Baste with remaining teriyaki sauce and flip. Cook an additional 3-4 minutes, until fish flakes easily when tested with a fork. 2 WW freestyle points per serving. Nutritional values are an estimate and are calculated with the full marinade amount. You will have lower sugar/carb/calorie values if you don’t use all the marinade.